I sent a bunch of my El Paso-inspired Chocolate & Chipotle (Holy Hole!) Cookies to Evelyn and her students. I have to admit that I was really nervous about how they’d grade my homework. It looks like I did OK. But this El Paso audience definitely likes a heavy hand when it comes to the heat! Thank you all for being my real-life cookie tasters! It was very useful to hear your feedback. In fact, I'm going to continue tweaking this El Paso-inspired cookie so that the heat and smoke of the chipotle really shine through. For the final, cookbook-ready recipe, I'm thinking of cutting back on the cinnamon, increasing the chiptole a little (aye caramba! ), and maybe even adding pecans for some crunch. Princess Ariele, a reader, real-life cookie taster, and coworker of Jon's, asked Jon to ask me to bake her a chocolaty, fudgy cookie topped with sea salt. Yes, ma'am. I've got the best recipe for a fudgy, super chocolaty chocolate cookie. And I've got the salt to sprinkle on top of it, so I'm good to go. See. I take requests. Just ask Evelyn. Oh yeah...and Mumma! Thanks, Lorraine! But don't worry about eating too many of my cookies, especially the Blueberry Muffin Tops. They're loaded with oatmeal (fiber) and blueberries (antioxidants), and they don't have any eggs, so they're practically health food. But this is a really good tip for cookie bakers out there. Freeze your extras so that you can have fresh-baked cookies on hand "on demand." "Just spoke to [Uncle] Warren, and he said that [Cousin] Rachael allowed him and [Aunt] Melissa one cookie each when they went to visit yesterday. Everyone loved them!! Warren said you must have done an amazing job packing and shipping them because they tasted like perfectly freshly baked cookies. We're still enjoying your cookies here!" Now you can reach the Oatmeal CookieBlog at www.oatmealcookie.typepad.com and at www.oatmealcookieguy.com. Thanks, Lorraine and David. Talking about URLs yesterday inspired me to carve out my own slice of internet real estate. You probably know by now that I use my coworkers--here and at my old office around the corner--as my recipe tasters. Well, thanks to Jon, I’ve expanded my reach a little. He’s started bringing a small Zip-Loc bag of cookies to work with him every Monday morning as well. Here’s a few of the comments Jon’s gotten on my Blueberry Muffin Top Cookies. Thanks, Kim and Ariele! I’m so glad you liked these cookies. And thank you for eating them. It was too dangerous a proposition to keep any around the house because, seriously, I think Jon and I would have eaten every single one of them…and then licked the plate clean. In an earlier post, I wrote about how Evelyn, an author of mine from my days as a college English textbook editor, emailed to say that she was going to share my blog with her students. To use a Massachusetts-ism, I was wicked excited about having my blog used as a teaching tool and about reaching readers all the way in El Paso, Texas. Thanks again, Evelyn, for sharing my blog with your students. I'm going to do some research and thinking, and I'll post an El Paso-themed oatmeal cookie recipe especially for you and your class--sometime soon, I hope. I’m thinking something sweet-smoky-spicy. Stay tuned. I love this challenge! Thanks, WF! You said they reminded you of the tops of the famous Jordan Marsh blueberry muffins before you even got a chance to read my blog this morning. How funny is that! Thanks to The Reel Blog, a Vincent D'onofrio/Law and Order: Criminal Intent fan site, for picking up my pic of Kathryn Erbe (Detective Alexandra Eames) on location on Friday! Mumma is a huge Law and Order fan. In fact, a trip home to visit her wouldn't be complete without a Law, SVU, and CI mini-marathon. But whatever you do, don't tell her that Chris Noth is leaving the show...again. Oops! Thanks, everybody! Me likey the blog-love. I think I gotta send some cookies up to Massachusetts…or maybe Mumma and Auntie could come down to NYC (nudge, nudge)? "Dude... They’re SO GOOD! There are no words. No words to do these justice!" Place 2 cups (12-oz. pkg.) Nestlé Toll House Semisweet Chocolate Morsels in a medium, heavy-duty plastic bag or container. Add 1/4 tsp. pure peppermint extract; seal bag or cover container. Shake to coat. Store for 24 hrs to allow sufficient time for morsels to absorb the mint extract. Place 2 cups Nestlé Toll House Semisweet Chocolate Morsels in a medium, heavy-duty plastic bag or container. Add 1/2 tsp. pure peppermint extract; seal bag or cover container. Shake to coat. The mint-favored morsels can be added directly to your recipe or melted according to morsel package directions. Note: Peppermint Flavoring and Pure Peppermint extract can be used interchangeably. Thanks so much for sharing, Gloria! Everybody print out this recipe. It's a great "formula" to have on hand when you need mint chips but don't have the time to wait for the King Arthur store to deliver or don't want to run out to pick up some Junior Mints. Hi, Evelyn! Thanks so much for sharing my blog with your students. I'll have to come up with a Texas-themed cookie for you all. Stay tuned! Thanks, Judith! And you've got me thinking of summer-friendly refrigerator cookies. Or, better yet, oatmeal cookie–ice cream sandwiches. Stay tuned! Thanks, Michael. I have to admit that these cookies were really good and definitely bring-in-able. Thanks for being such a willing taste tester! Thanks, Jen and Ariana! I hope to make a whole bunch more cookies that get this kind of reception. TypePad chose my Oatmeal CookieBlog as the a featured blog for June 12, 2008. Woohoo! What's next...a key to the city? Thank You, Ma'am! I Hope to Have S'more. Thanks, Shelia! I hope I keep coming up with recipes that you all enjoy. “Nothing like a classic to be absolutely delicious! I'm kind of addicted to the oatmeal raisin cookies hehe. Did you use some kind of large crystal sugar on them? They are amazing. :-) Just so you know." Thanks, April! I’m so glad you like them. You guessed right: I gave these guys a roll in turbinado sugar before baking. It gives the finished cookies a nice, sugary crunch to contrast with the chewy interior. Thanks, In-Young. It was my pleasure! "In big letters ‘THANK YOU!’ is what teachers had to say! Another girlfriend that I shared some with said it was her favorite of all time (and I bake for her a LOT!). Well, well, looks like I've got another induction into my ‘Winners’ notebook! Thank you, Greg [Oatmeal Cookie Guy]! Next up, I'm trying that German Chocolate yummy!" Three cheers to you, Dawn. You did an awesome job, and the pic you sent (below) proves it! "Hi Greg [Oatmeal Cookie Guy], I made these babies today; so delicious! I ate 3 at one sitting, no kidding! My 16-month-old ate 1 jumbo at a go and still wanted more. Your blog's going on my fave list, so glad I saw your entry on Martha's site. Next up...your Florida Cookies!" Thanks, Amelia! I’m so glad you and your son liked these guys. Once you get the stuffing technique down, it’s a breeze. I can’t wait to see how the Florida Cookies turn out. And thanks for the blog add! So instead of doing a huge grocery shopping up there, I decided to bake in my kitchen here in NYC and send my love through the mail. "So, I think I had said that the cinnabon cookies were my favorite, but I lied. This week's cookies are the best! I didn't even know I liked apricot! Haha! I am totally stealing this recipe (and I will of course credit you whenever I make them)." "Your cookies are SO AMAZINGLY good today--I love them! I missed out on earlier cookies b/c I wasn't fast enough in the kitchen, but I grabbed one of these this morning and just wanted to tell you how YUM they are. I think I might have to make them one day. Thanks for bringing them in!" Thanks, Emily. I don’t know what to say…I’m blushing. "You've outdone yourself this time. This [German Chocolate Cake] cookie is incredible! And the peanut-butter filled ones were delicious and complex, like a fine wine. Thank you so much!" Thanks for your note, Catherine. I'm a little bashful about admitting that I'm not a huge chocolate fan, but even I could eat a dozen or more of (either of) these cookies and still want more. "I tried your Va-Va-Vanilla cookies this weekend, and they are awesome! Some family was over for Easter and proclaimed them the best oatmeal cookies ever. Thanks for the recipe!" Thank you, Vicky! 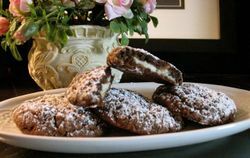 Maybe these cookies will become part of your Easter tradition--or at least part of your oatmeal cookie repertoire. "I made your Hot(ter) Chocolate cookies this weekend. They’re amazing!! Thank you for sharing the recipe! When I was in line at the grocery store buying the ingredients, the person next to me asked what I was making because I had such good things in my basket. When I told him, the other person next to me said they wanted the recipe, and then the cashier got interested too, so I gave all of them the link to your blog. You’re famous in the Park Slope Union Market." I'm so glad you liked the recipe, Sarah. And thanks for the blog-licity! "My son and I made the S’mores cookies last night. OMG they were seriously the best cookies I have ever tasted. We try to set aside one day a week as a baking day and cookies and breads are our favorite things to make. We will definitely be trying more of your recipes in the future." Thanks, Sheila! And happy baking. An unsolicited email from a coworker/cookie taster. I guess my take on a classic Girl Scout cookie was really, really bring-in-able. "You make Mondays worth coming to work for. What that poor sentence is trying to say is: Awesome cookies today. It's all I can do not to take the whole bag and hoard it at my desk."